2018 BC ORV Trails Fund is now taking applications! 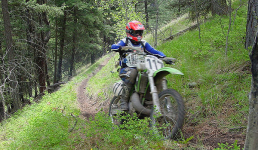 BC ORV Trails Fund is now taking applications! This is great news for the motorized trails community, lots of work by dedicated volunteers and staff involved in getting this funding in place for now and future generations. Why not make the investment to join your local club today, and leverage your dollars to help build and maintain great trail networks. Thanks in advance! Its 2018 and BCORMA has lots on the go! Its 2018 and BCORMA has lots on the go! Biggest is getting the BC ORV Trails Fund operational in 2018. ORV Trails Fund was set up by the Government at our request to get some of your registration dollars back to trails. 2018 Vancouver Motorcycle Show Friday Jan/19th to Sunday Jan/21st - come visit us at our booth and talk where to ride - Great Trails BC, getting trained up - MSF DirtBike School, the ORV Trails Fund to contining to build and maintain PowerSports trails across BC. I hope you’re all having an exciting spring season! I wanted to make sure you’ve all heard that registration is open for this year’s Red Bull Rocks & Logs June 24-25, 2017 at the Wild Rose MX Track in Calgary, AB.